Amazon Price: $164.99 $69.99 You save: $95.00 (58%). (as of October 18, 2017 2:45 am - Details). Product prices and availability are accurate as of the date/time indicated and are subject to change. Any price and availability information displayed on the Amazon site at the time of purchase will apply to the purchase of this product. 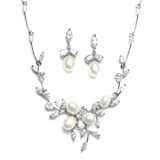 Sheer elegance describes this necklace and earrings set boasting lustrous Genuine Freshwater pearls and brilliant Cubic Zirconia leaves. The 17 1/2" inch silver rhodium necklace measures 1 1/4 inches h at the center and the matching drop earrings are 1" h. Complete your luxurious ensemble with the Mariell Designs style 3041B, sold separately. We promise you'll adore the organic beauty and endless glamour of our top selling neck set – or your money-back. Treat yourself or someone you love to some seriously gorgeous sparkle with head-turning designer styling! Meticulously crafted with AAAAA Cubic Zirconia and Genuine Platinum plated Silver Rhodium, you'll have the distinctive look of fine jewelry at a fraction of the price. As always, enjoy Mariell's 100% Risk-Free Purchase and Lifetime Guaranteed.